They work, but there aren’t one-to-many relationships between every level and query performance may be worse than with a natural user hierarchy. 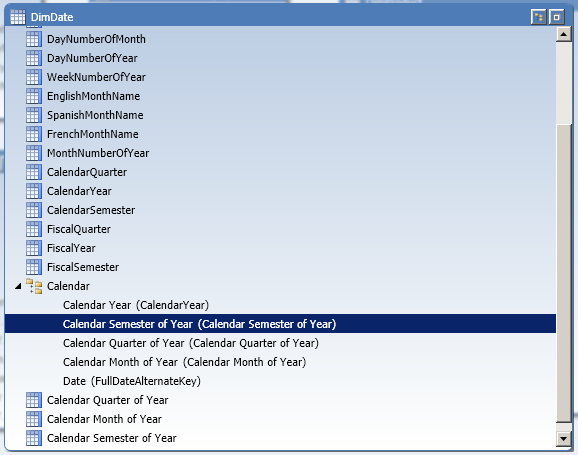 …and up to recently I assumed that this was an issue that simply wasn’t relevant to Tabular. However, after a recent conversation with Marius Dumitru from the dev team and Greg Galloway I now know this isn’t the case! 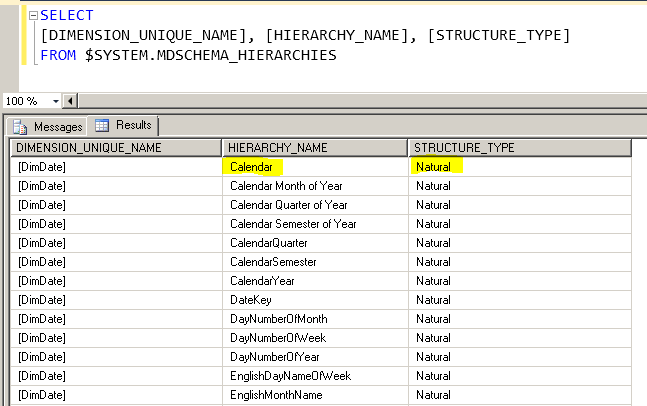 In this case you can see that the Calendar hierarchy that I created on the DimDate table is unnatural; SSAS has determined this during processing (specifically during the Process ReCalc stage) by examining the data itself automatically. 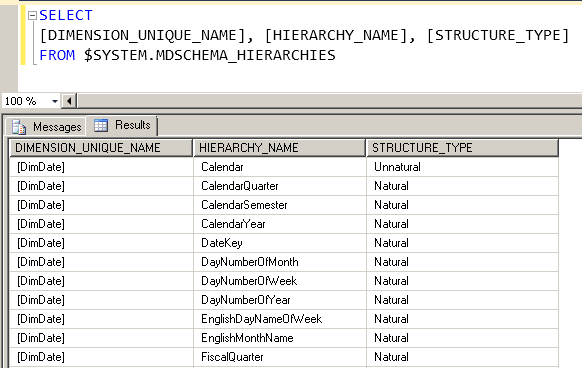 It turns out that natural hierarchies in Tabular can result in faster query performance because certain MDX and Formula Engine code paths in the SSAS engine are still not optimised for unnatural hierarchies. I don’t have any specific examples of when this occurs at the moment but if I do find them I’ll be sure to update this post. 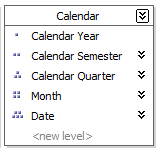 And if anyone else using Tabular, or even PowerPivot (and I assume this is relevant to PowerPivot too) finds a good example of how changing to a natural user hierarchy improves performance please leave a comment. Just to echo what Marco said in his blog post from last week, the PASS BI Virtual Chapter is currently looking for presenters, especially from Europe or European-friendly time zones. If you are interested please send some ideas for abstracts plus some information about yourself and your speaking experience to PASSDWBIVC@sqlpass.org. Presenting online is a great way to get speaking experience, especially if you are not able to attend conferences or user groups on a regular basis. We hope to hear from you soon! Almost every time I write MDX calculations, I end up using scoped assignments – it’s by far the easiest way to control where your calculations work inside a cube. 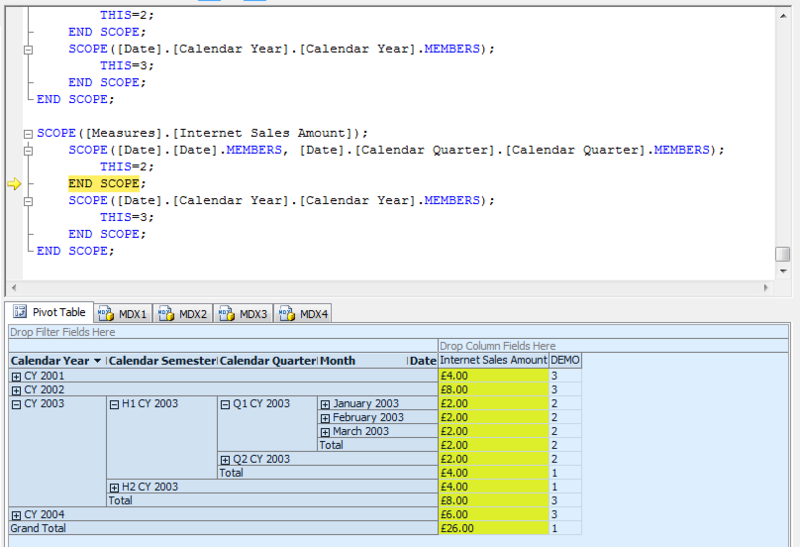 However making sure that your scoped assignments work in the places that they’re meant to work and don’t overwrite each other can be very tricky indeed (for a brief introduction to the subject and these problems, see this session I gave at SQLBits a year or so ago), so in this post I’m going to show you how you can use the MDX Script Debugger in BIDS to help you do this. 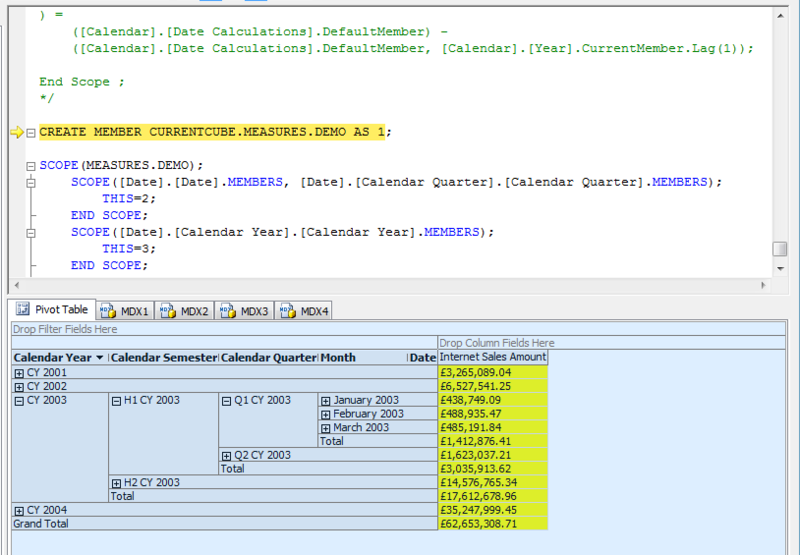 Despite its name the MDX Script Debugger doesn’t actually help you to debug individual MDX expressions or calculations. 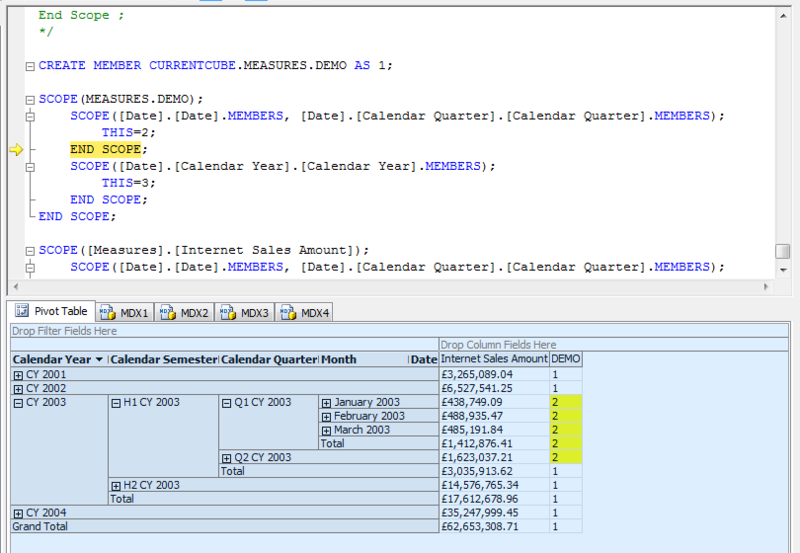 What it does is clear the MDX Script of the cube then allow you to step through each statement in the MDX Script, applying them one after the other, so you can see the cumulative effect on a query. This is only really useful when you’re working with scoped assignments because it allows you to see which cells in your query are changed with each successive assignment. 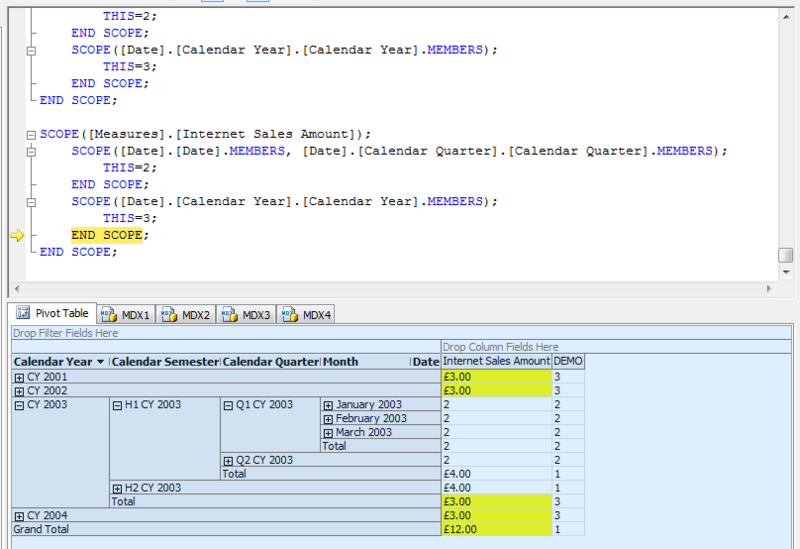 In the top pane you can see the Calculate statement highlighted – this is the point in the script that has been reached as you step through the code. 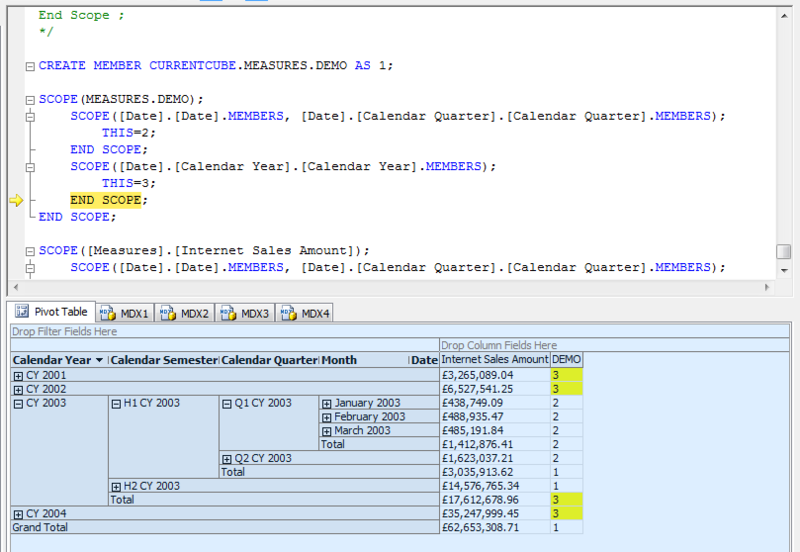 In the bottom pane you have a browser control where you can construct a query plus four panes where you can enter your own hand-written MDX queries. Notice how, in this case, because you’re scoping on a calculated measure only the cells you scoped on have their values changed. 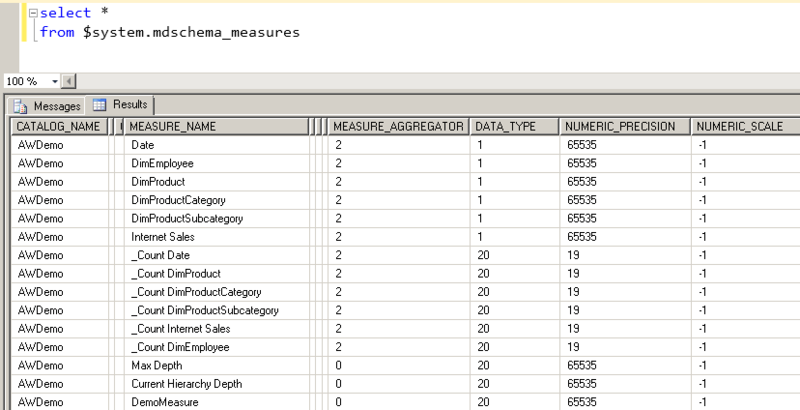 This is in contrast with scoped assignments on regular measures: because regular measures aggregate up, scoping on a regular measure not only affects the values in the cells you scoped on, but those values will then also be aggregated up though the cube. To show what does happen when you scope on a regular measure, look at the next set of scoped assignments on the Internet Sales Amount measure. 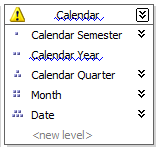 The first assignment scopes on the Date, Month and Quarter levels and sets their values to 2; however the Year level values now show the aggregated totals of all the quarters in the year, so if there are four quarters in a year then the year will show 4 * 2 = 8. The All level total is also similarly affected. Hit F10 some more and you’ll reach the end of the MDX Script, whereupon you’ll go back to the beginning and can start all this again. Go to the Debug menu and click Stop Debugging to finish. Useful bit of functionality, isn’t it? Certainly one of the least-known features of BIDS too. 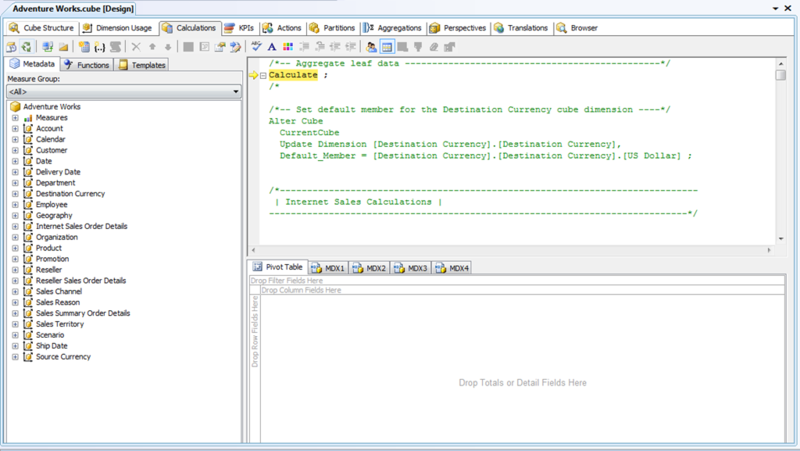 One last point – if you try to use the Debugger and hit the infamous SSAS Locale Identifier bug, check out Boyan Penev’s post here on how to solve this issue. Over six years ago now I wrote what proved to be a very popular post here on my blog called “So, what is the UDM?”. It was written in response to the widespread confusion around the time of the release of Analysis Services 2005 about what the term “UDM” actually meant. In a sense “UDM” was just another name for an Analysis Services cube, but it also represented the nebulous concept of Analysis Services being a semantic layer suitable for all your reporting needs; however people often thought it was a new product that somehow replaced Analysis Services cubes and got themselves tied in all sorts of knots as a result. Thankfully, use of the term died out pretty quickly as everyone started referring to Analysis Services as, well, Analysis Services. Fast forward to the present day and I can see a similar amount of confusion about the term “BI Semantic Model” or BISM for many of the same reasons. What is the BI Semantic Model exactly? 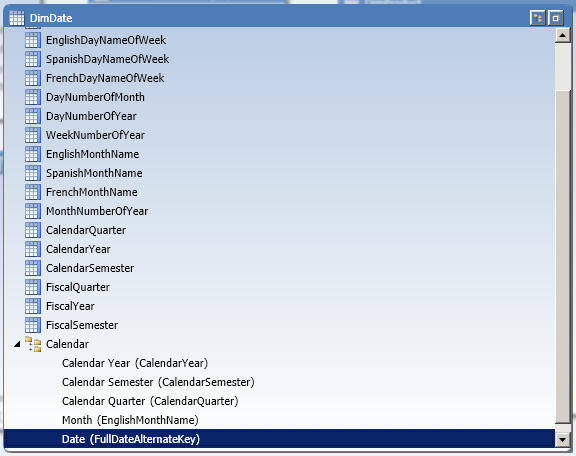 It is… Analysis Services 2012 plus PowerPivot. Let’s be clear though: it is not just the new Analysis Services Tabular Model, although the term BISM is all too often used as if it did mean that. It’s not even a specific bit of software. Analysis Services 2012 consists of two parts, the Multidimensional Model which is the Analysis Services of cubes and dimensions that we already had in 2008 R2 and earlier versions, and the new Tabular model which is the Analysis Services of tables, relationships, in-memory storage and column store. BISM refers to both models plus PowerPivot, or rather it refers to the way that Analysis Services and PowerPivot can be used as a semantic layer on top of other data for reporting purposes. A single term like BISM suggests that Analysis Services 2012 and PowerPivot are a single, cohesive product, whereas the Tabular and Multidimensional models are actually very different beasts. If you’re going to be working with Analysis Services 2012 on a project the first decision you’ll have to make is which type of model to use, and if you change your mind later you’ll have to start development again from scratch and learn a lot of new skills. I hope one day that the two models will merge again but it won’t happen soon. Microsoft has correctly identified that many people want to do BI but were put off by the complexity of building Multidimensional models in previous versions of Analysis Services. The simplicity of the Tabular model goes a long way to solving this problem; Tabular also replaces Report Builder models which were really a just a simple semantic layer for people who didn’t like SSAS or had valid reasons to stay with relational reporting. In order not to scare off this market a new name is necessary to avoid the negative connotations that come with “Analysis Services” and “cubes”. Calling something a “semantic model” suggests that it’s a nice, light, thin, easy-to implement layer on top of your relational data warehouse, with no data duplication (which is often seen as a Bad Thing) involved. In actual fact anyone who has used the Multidimensional model will know you almost always use MOLAP storage which involves all the data being copied in Analysis Services; and I suspect when people start using the Tabular model they will be using it in Vertipaq mode (where again all the data gets copied into Analysis Services) rather than in DirectQuery mode (where all queries are translated to SQL which is then run against SQL Server). Now I’m not going to suggest that there’s anything wrong with these marketing objectives – anything that sells more Analysis Services is good for me – or that the Tabular model is bad, or anything like that. All I want to do is suggest that in the SQL Server technical community we stop using the term BISM and instead refer to Analysis Services Multidimensional, Analysis Services Tabular and PowerPivot so we’re always clear about what we’re talking about in blog posts, articles, books and so on. I don’t think using the term BISM is useful in any technical context, just as the term UDM wasn’t in the past, because it is a blanket term for several different things. I also think that so many people are confused about what the term BISM actually means that it is becoming counter-productive to use it: people will not buy into the MS BI stack if they’re not really sure what it consists of. This gives you a lot of flexibility when writing calculations but it also can be a big problem when you want to extract data from a cube into another system, as anyone who has tried to do this will know. 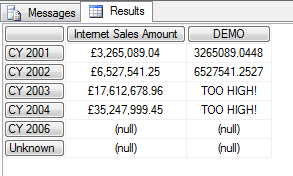 Measure ‘Internet Sales'[testtype] : The second and third arguments of function IF have different data types. This is not supported. On balance I think I prefer having measures strongly typed, and for one thing it opens up the possibility of using the Tabular model for certain forms of ETL. 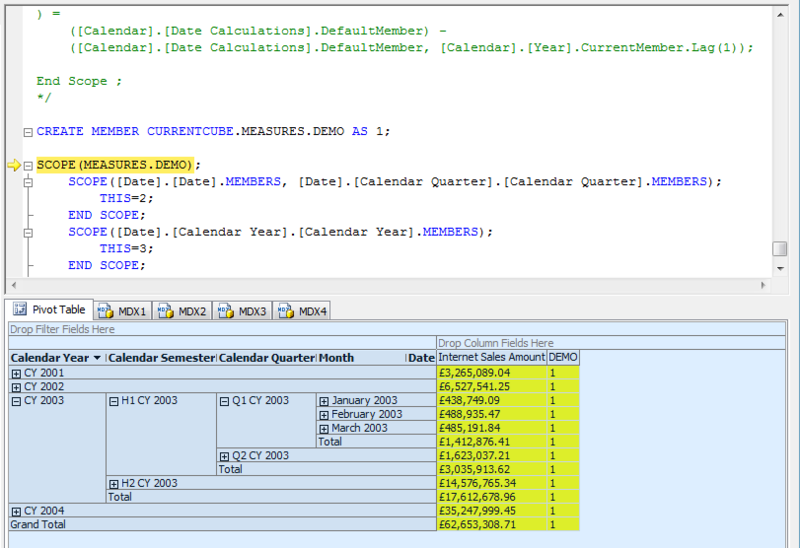 I’ve already seen one customer of mine replace a CTE in TSQL by loading their data into Tabular and using the PATH functions instead, getting some significant performance benefits as a result, and I’m sure there will be plenty of other scenarios where ETL requires complex calculations to take place that the incredible performance of DAX will make loading all the data into a Tabular model (even if the final destination of the data is a relational data warehouse) a serious option. DependsOnDimension is really just a hint for use when designing aggregations using the Aggregation Design Wizard or the Usage Based Optimization Wizard. Normally the aggregation design algorithm estimates the size of aggregations assuming dimesions are independent, but this property lets it know that one dimension is strongly determined by another dimension. This should not affect your browsing experience in any way. In Analysis Services 2000, DependsOnDimension was also used as part of the definition of virtual dimensions as a way of specifying the source for virtual dimension’s levels. I did some quick experiments in BIDS and couldn’t see any evidence that setting this property affected what aggregations were designed by the Aggregation Design Wizard, but they weren’t exhaustive tests by any means. If you’re taking the trouble to enter row counts and set the AggregationUsage property you should probably try setting it if you have any dimensions that are very closely linked, just in case it does have an impact.